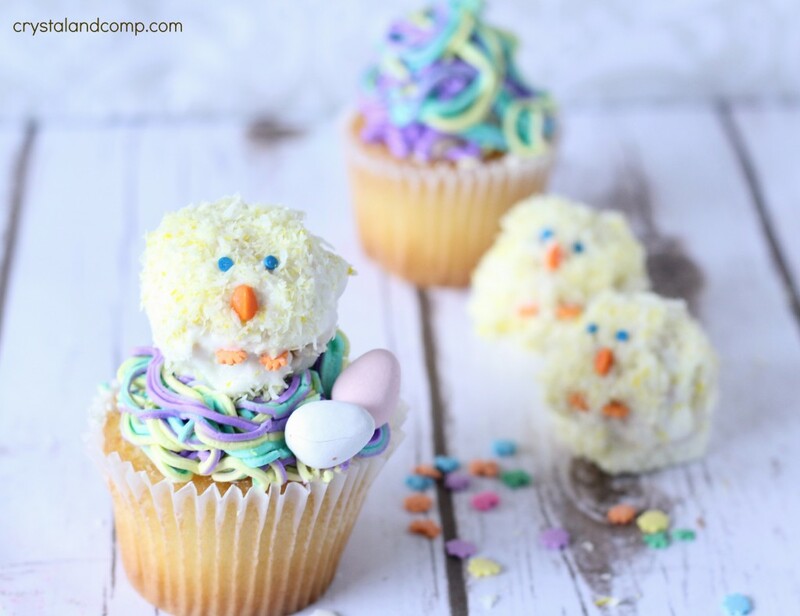 Are you looking for a fun way to decorate your cupcakes for Easter? 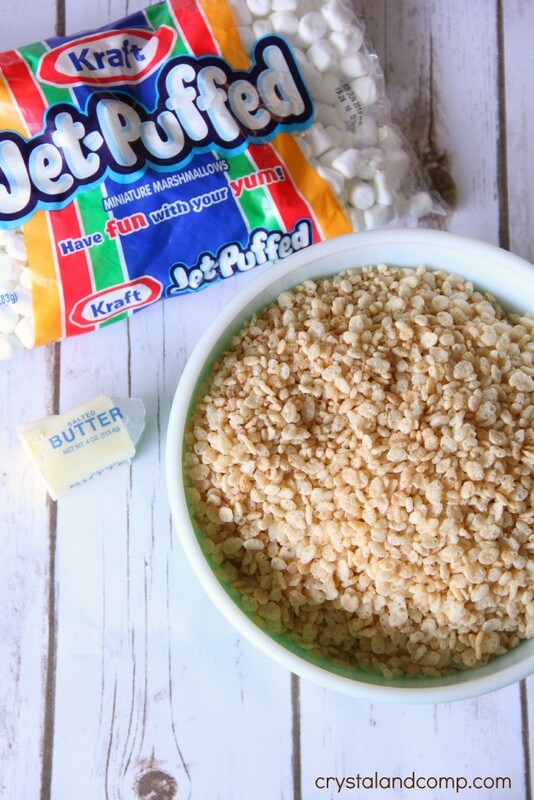 Have you ever made something out of Rice Krispies® other than traditional Rice Krispies Treats®? I thought it would be super fun to make little baby chicks. And then we can use them as cupcake toppers. Fun, right? Let me show you how easy these are to make. Perfect for Easter, a baby shower or a first birthday party! You will love them! In a large pot on the stove, melt the butter over low heat. Next, add the package of marshmallows. Stir them until they are melted and fully combined with the butter. Add in the Rice Krispies®. Stir, stir, stir coating the cereal well. Remove from heat and let it cool a bit. Use a double boiler to melt the white chocolate wafers over low-medium heat. Or, you can melt the chocolate in the microwave, but be careful. If you melt it at a heat that is too high or too fast, it will harden. Once the chocolates are melted, set them aside and let it cool a bit. It takes a long time for this chocolate to harden back up… so no worries. 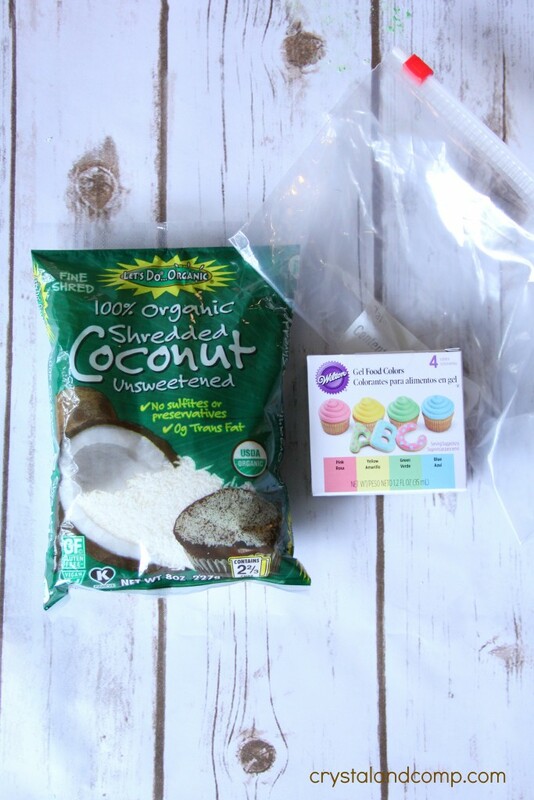 Pour the coconut flakes into a ziplock bag. Add 5-7 squirts of food coloring to the bag. I did yellow so we could have yellow chicks. Pink or blue would be precious too, especially for a baby shower. Seal the bag and shake it around until the coconut is colored thoroughly. Add the icing to the piping bag. I did three bright colors. You can add all three colors to the bag and they will make rainbow grass. 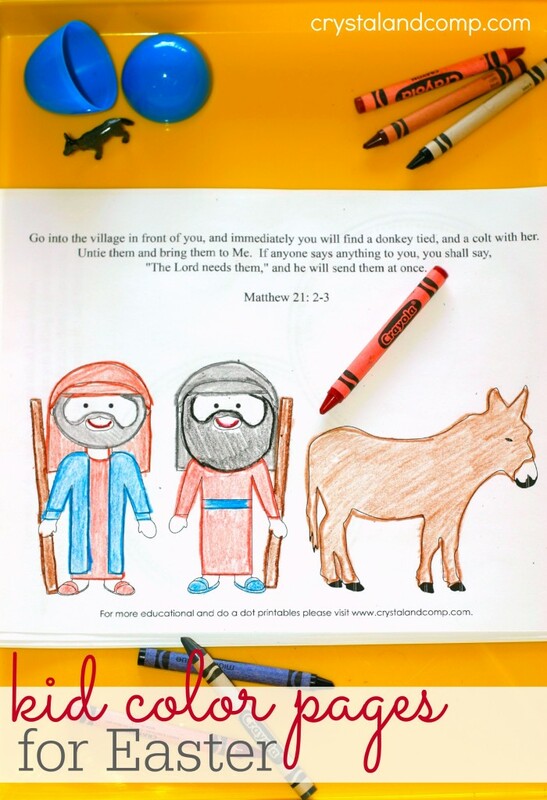 Super fun and festive for Easter! 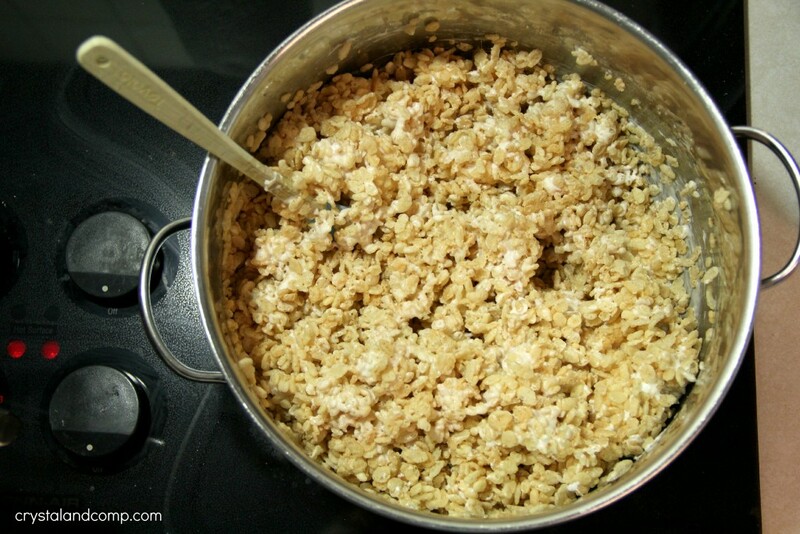 Once the Rice Krispies cool a bit, start to form small balls by rolling small handfuls of the mixture in your hands. Place them on a cookie sheet that is covered in parchment paper. Thoroughly dip each ball in the white chocolate. Place the ball back on the parchment paper cookie sheet spaced an inch or two a part. While the chocolate is still melted, choose two bright color confetti circle sprinkles to add as eyes. I used the blue ones. Use a toothpick to adjust them and ensure they are securely added. Break off a small piece of yellow Starburst candy. Using your fingers and thumbs to press it into a shape that resembles a beak. I just held it in my left hand in between my index finger and thumb and then used my right thumb to press the back end of the candy to flatten it. It made a shape that looked perfect for a beak. Now, position this candy where the beak would be on the little chick. Next take two orange wildflower confetti shapes and place them as feet. I just pushed them in until they seemed to be going into the Rice Krispies treat a bit. Once the chocolate firms up, everything will stay in place perfectly. Once they are cool there will be a flattened piece of chocolate from where the chocolate cooled and puddled, so to speak. Just break this away with your hands. Ice your cupcakes using the grass-like tip I linked to above. You can make your grass stringy like I did or grass that stands. Whichever method you choose. 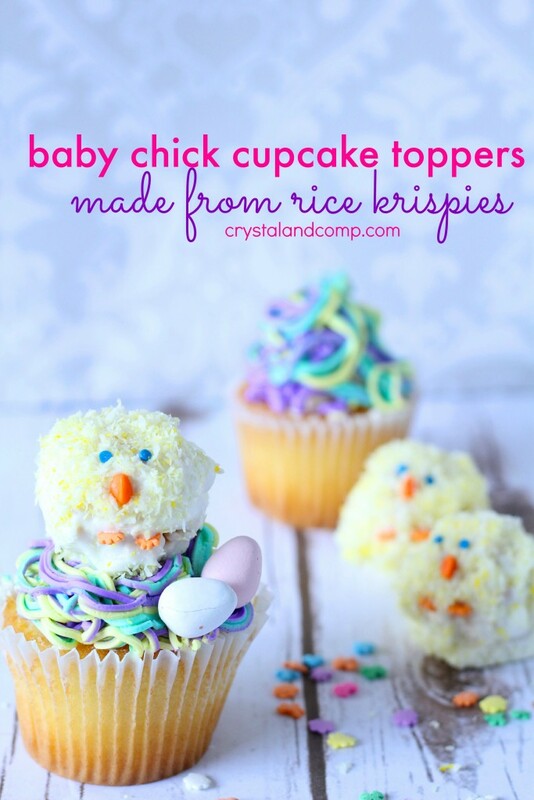 Top your little chick on the cupcake. I even added two egg candies. Yum! These are perfect for your festive celebration! 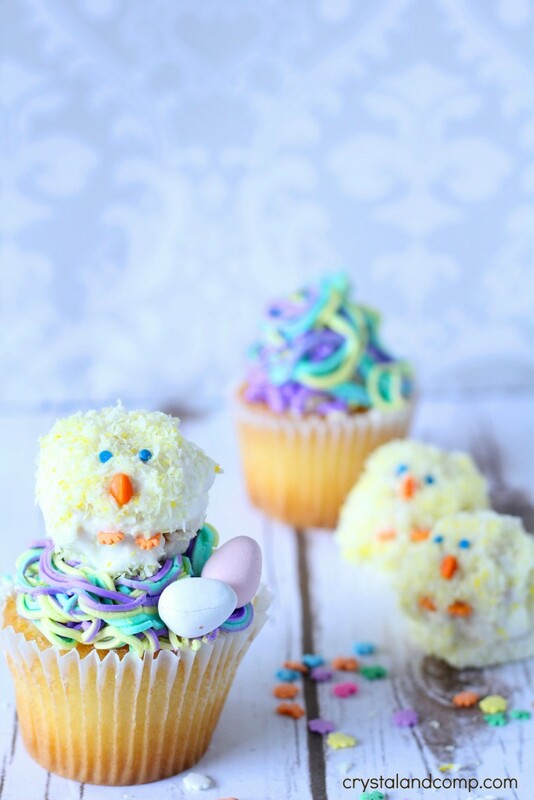 The perfect Easter cupcake topper! In a large pot on the stove, melt the butter over low heat. Next, add the package of marshmallows. Stir them until they are melted and fully combined with the butter. Add in the Rice Krispies®. Stir, stir, stir coating the cereal well. Remove from heat and let it cool a bit. Use a double boiler to melt the white chocolate wafers over low-medium heat.Or, you can melt the chocolate in the microwave, but be careful. If you melt it at a heat that is too high or too fast, it will harden.Once the chocolates are melted, set them aside and let it cool a bit. Pour the coconut flakes into a ziplock bag. Add 5-7 squirts of food coloring to the bag. I did yellow so we could have yellow chicks. Seal the bag and shake it around until the coconut is colored thoroughly.Add the icing to the piping bag. I did three bright colors. 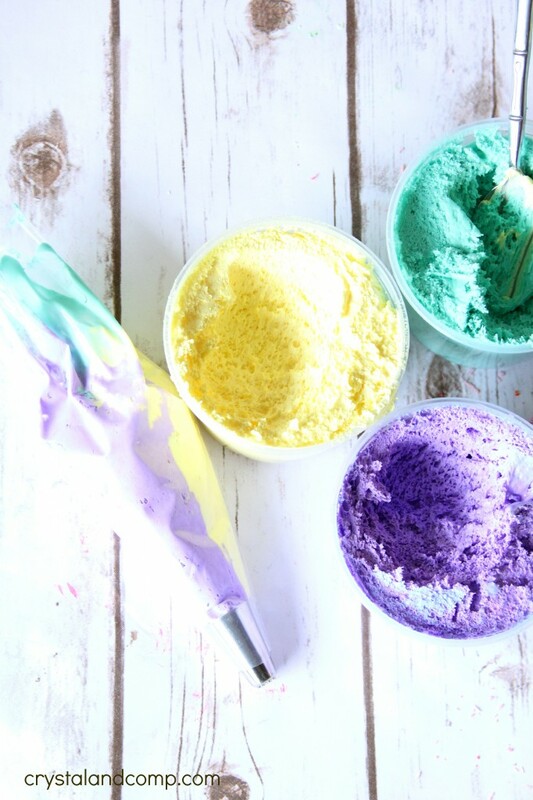 You can add all three colors to the bag and they will make rainbow grass.Once the Rice Krispies cool a bit, start to form small balls by rolling small handfuls of the mixture in your hands.lace them on a cookie sheet that is covered in parchment paper.Thoroughly dip each ball in the white chocolate. 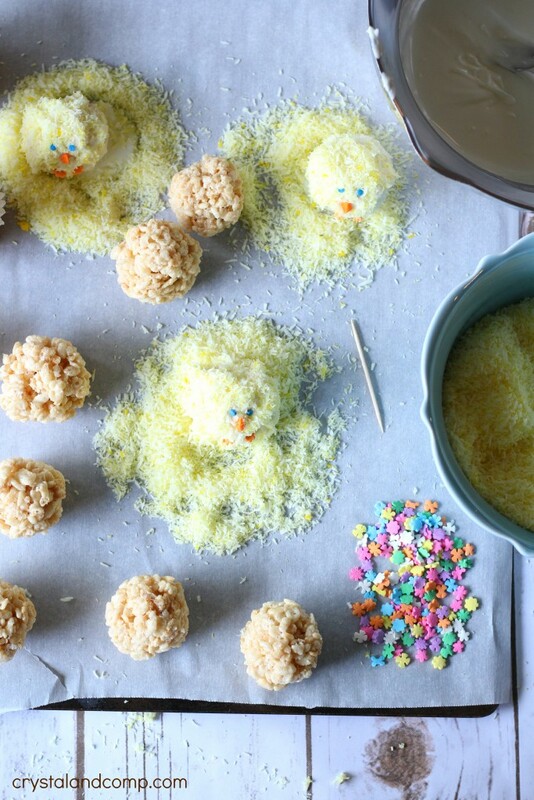 Place the ball back on the parchment paper cookie sheet spaced an inch or two a part.Sprinkle them thoroughly with the colored coconut.While the chocolate is still melted, choose two bright color confetti circle sprinkles to add as eyes. I used the blue ones. Use a toothpick to adjust them and ensure they are securely added.Break off a small piece of yellow Starburst candy. 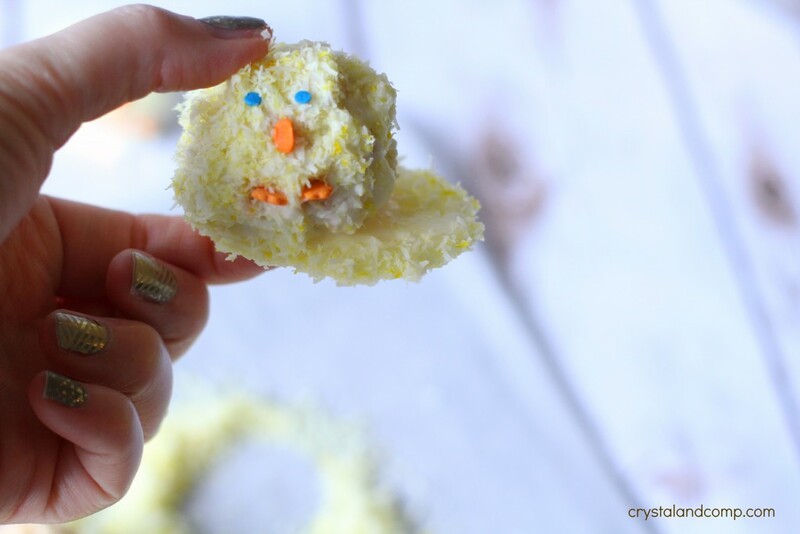 Using your fingers and thumbs to press it into a shape that resembles a beak.Next take two orange wildflower confetti shapes and place them as feet.Let them cool 100%.Ice cupcakes and place chick on top. 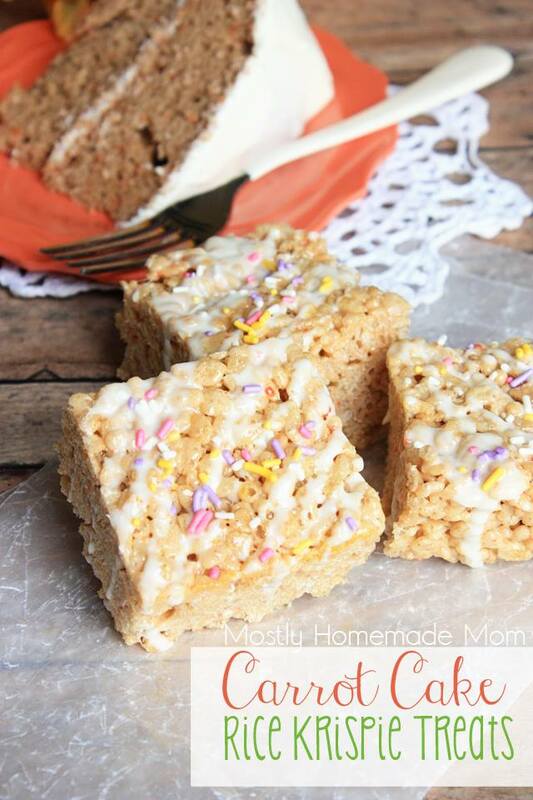 Oh, while you’re here check out this super fun Carrot Cake Rice Krispies Treats® idea from my friend at Mostly Homemade Mom! Kellogg Company sponsored this blog post. The opinions and text are all mine.